Some picture books have an amazing ability to leave you feeling happy and satisfied. It’s the stories that capture you at the start, make you smile or laugh (or both) and end with awesome twists and surprises. These are the books you remember and reach for again and again. And The Cave, I am thrilled to tell you, is one of these books. In The Cave, a little creature never leaves its home because of the hungry wolf that sits in waiting, ready to eat it the moment it steps outside. In the most outrageous and hilarious ways, the wolf tries to get the little creature to come out, but the little creature always has a witty comeback. And then one day the wolf offers something the creature can’t resist (which you won’t predict), and out the little creature comes with big surprises in store for the wolf. 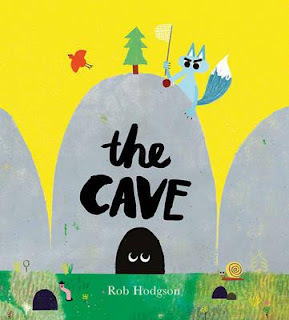 Written and illustrated by UK designer Rob Hodgson, this is a hilarious and entertaining story. It’s fun and quirky and unexpected, and, as all good books should, it will leave you feeling happy and satisfied. The text weaves perfectly with the illustrations, which are as amazing as the story. Hodgson’s style is funky and unique—superb in its simplicity, with cool print-like details and awesome scribble effects. And I loved searching for the little worm and snail on each page to see what mischief they were getting up to. If you’re looking for a picture book with humour, this one is for you. It is entertaining, engaging and has been requested nightly in my household since it landed on my doorstep.